Note : Listed images was taken after Kept the Parad beads few hours in water , The color of siddh parad beads convert into golden color after kept in water which is one of the property of pure siddh parad beads . When the parad beads will clean or rub via soft cloth there color becomes a silver color . Design : Pure Siddha Parad Mala is made with pure Parad beads strung with traditional knots in between each bead. 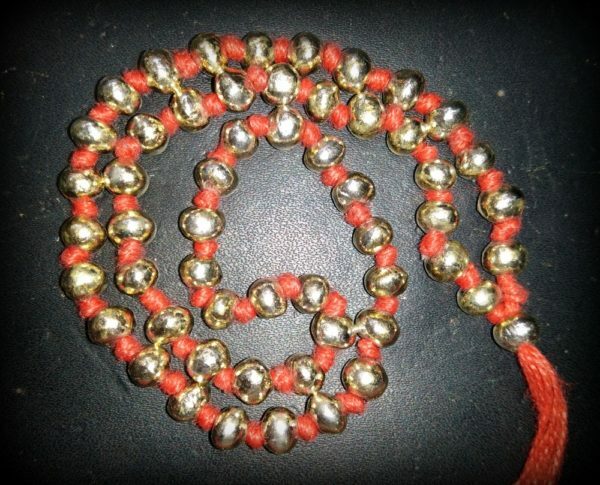 Pure Siddha Parad Mala is worn for peace, prosperity, health and spiritual growth. The healing and medical properties of the Parad mala works best when wore as a choker mala close to the neck or as a hanging mala with a sumeru. Parad Bead (Siddh Gutika) are Complete with 8 Samkaras: Complete with 8 Samskaras i.e. 8 stages of Purification are completed as per Parad Sanmhita and a thorough medicated and hygienic removal of Saptakanchuki is done. The Siddha Parad (Mercury mouth closed with Aghor Vidhya) is formed to make Murthi – Badhha/Agnibadha (heat sustaining) Parad Gutika. The Gutika gives 24 Ras and 5 Tatva which removes all diseases from the body. ** Worship on Parad Rosary is capable of giving instant Luck, wealth, position, name and fame. ** The presence of Mercury beads around the neck is itself a complete life. At home it blesses with unity and harmony in the family and guides its devotees to spiritual path. ** It is also written in various purana’s that by worship on Parad Mala regularly , Goddess Laxmi remains alway’s in a house . ** If a person regularly sips the water poured on Pardeshwar then all illness are said to rest and the person acquires mental agility. ** If one does the Pooja of Pardeshwar with the chant of Aghori mantra and offers Bilva patra then it destroys the possibility of sudden death and any kind of poverty. ** If one does the prayer of Pardeshwar with the chant of Mahamritunjaya mantra and also does its Abhishek with milk and ghee then all kinds of malicious diseases are removed. ** If the Pooja of Pardeshwar is done with the chant of Rudragayatri then the house is always peaceful and family happiness is always present. ** If Parad Mala is covered with layer of white sandal and karpur and then wear , then all the anishta and unfavorable grahdosh go away and the person stays mentally healthy. **By the wearing or counting of Parad beads even the henious sin of Bramhin-hatya, Gau-hatya, Bal-hatya (dosha due to killing of a priest, cow or child in previous births) can be totally washed off. ** It is said in the Bramha-puranas that he who wear or japa the Parad Rosary devotedly,wheather one is a male, female, bramhin, kshatriya, vaishya or shurdra, gets full worldly pleasures and at last attains supreme destination (moksha) . ** Parad has a special significance in Ayurveda too. Wherever the Parad mala is wear disease and illness does not stay there. It helps in controlling various disease like, high blood pressure, asthama and heart problems and help to increase your will power. ** It brings knowledge by evoking goddess Saraswati and enlightens your children with knowledge and sharpens their mind. ** Immerse the Parad rosary in the Ganges water and sprinkle it on a person or in the premises. Malefic planetery effect and black magic evils will disappear.Worship the Parad mala every monday by offering Bilvapatra/Belpatra and chanting the mantra of ‘Om Namah Shivay’ a 108 times. It will give fruitful results reguarding your vastu dosha, graha peeda, court matters, karya siddhi, business & trade, sevice, jobs,promotions, success in studies, health, wealth, money, name, fame, property, peace and harmony. It is believed that, to have a rosary made by mercury (Parad) one must be blessed through good karmic deeds of the previous birth, but by the grace and compassion of Lord Shiva, we have achieved it and made it for the benefit’s of people of the world for peace and prosperity.